Unlike So uth Sea pearls, which are cultured in oysters, freshwater pearls are cultured in mussels or oysters in rivers, lakes or ponds and tend to be more irregular in shape and more varied in color than saltwater pearls. Nearly 96% of freshwater pearls today are produced in China. With advances in culturing technology, Chinese freshwater pearls have played a much more important role in the jewelry industry than ever before. Freshwater pearls' lower price than saltwater doesn't necessarily mean low quality. In fact, some high quality freshwater pearls are very valuable. Currently the typical sizes range from 4 mm to over 10 mm. The many varied shapes of freshwater pearls can be used to make impressive looking jewelry pieces that sell for moderate prices. When cultivating freshwater pearls, shell mantle tissue is inserted into the host mussel, insead of a bead nucleus. After the first harvest, mussels can spontaneously grow pearls a second time. Hence on occasion cultured freshwater pearls either do not have nucleus or have a very small nucleus. This means that freshwater pearls consist of very thick nacre, making them denser and more durable. Only those freshwater pearls with consistently high luster are considered of high value. Blemishes such as discolorations, pits, bumps, wrinkles and cavities can decrease the value of pearls. 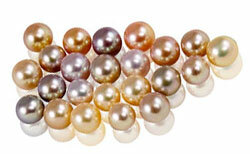 Freshwater pearls come in a wide variety of natural body colors: white, pink, orange, gold, lavender and silver. · The color doesn't affect the price of freshwater pearls as much as it does that of saltwater pearls. · Pink or silver overtone can increase the freshwater pearl value. · Iridescence increases the value too. · Natural color pearls are more valued than treated pearls. By inserting different shapes of nuclei, unique shapes of freshwater pearls can be harvested. Symmetry and round shapes are of higher value than baroque. Because of recent strides in cultivation technology, we've been able to create star shaped and even heart shaped pearls. Size of freshwater pearls is not as important a price factor as is luster and surface quality, but the rule of "the larger, the more valuable" still applies. Currently, freshwater pearls are available in sizes from 4mm to over 20mm. Freshwater pearls are often treated to obtain colorful pearls in various shapes. Treated freshwater pearls bring the fashion industry more inspiration and possibility of creating uniquely stylish pieces. The most often used treatments are bleaching, dyeing, or irradiation.